This resort will be seamlessly connected to Star Wars - Galaxy’s Edge at Disney’s Hollywood Studios. It’s a first-of-its-kind resort that will combine luxury with complete immersion into an authentic Star Wars story. Your journey through space will start with everyone departing together for a multi-day Star Wars Adventure on a starship filled with characters and stories that unfold around you on your journey. At the resort, you will immediately become citizens and can dress in the proper attire. This resort will allow for a total Star Wars experience. Stay tuned for more information on this fascinating resort! This reimagined land will feature four whimsical neighborhoods representing favorite Pixar stories with newly theme attractions, food and merchandise. You will enter Pixar Pier through a new marquee, which will be capped with the iconic Pixar Lamp later this year. Pixar Pier will also include the all new Incredicoaster - a super combination of characters, lights and special effects that will have the Parr family racing alongside you in a high-speed adventure. A dazzling new float will join the popular “Paint the Night” Parade. This float will feature Mr. Incredible, Elastigirl, and Frozone as well as innovative visual technology that will bring Violet, Dash, and Jack-Jack to life. “Paint the Night” Parade will make its debut in Disney’s California Adventure when the first-ever Pixar Fest celebration begins throughout the Disneyland Resort on April 13, 2018. 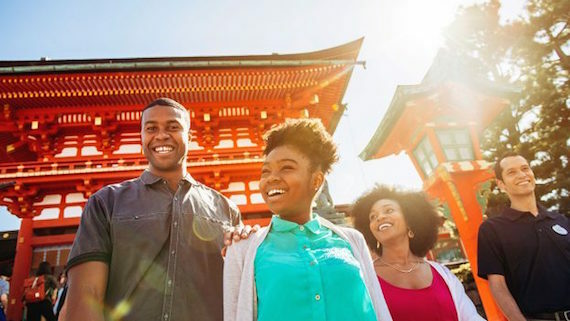 This trip will offer immersive, cultural experiences like visiting temples in Kyoto, learning sword techniques from a master samurai, exploring the bustling city of Tokyo and so much more. You will be able to book this new adventure later this spring, so look for more details in the coming months. The ‘Guardians of the Galaxy’-inspired coaster is part of the ongoing work to transform Epcot into a place that’s more family, more relevant, more timeless and more Disney. “As we build upon its core mission of optimism and hope to inspire the world, the real will become fantastic and the fantastic will become real—in whole new ways at Epcot,” Bob Chapek, Chairman of Walt Disney Parks & Resorts, said. The attraction is set to open in time for the 50th anniversary of Walt Disney World Resort in 2021. Stay tuned for more updates. Disney’s first Mickey-themed ride-through attraction will feature a new theme song made especially for the ride and a new experience that defies logic, which Disney is calling "2½-D". No glasses required. On the attraction, the fun begins with the premiere of a new cartoon short with Mickey and Minnie getting ready for a picnic. As they are driving along, they drive alongside a train with Goofy as the engineer. Then in one magical moment, you will be transported into the movie and onto Goofy’s train for a wild and wacky ride. Stay tuned for more information on Mickey and Minnie’s Runaway Railway! For more than 20 years Disney Parks has partnered with Pixar to bring their compelling stories and beloved characters to life in the parks—and soon even more Pixar is coming to both Disney Parks. New Pixar-inspired experiences are set up for several parks as we get ready for “Incredible Summer.” At Magic Kingdom Park, you can visit Tomorrowland and party with characters from “The Incredibles”—including Edna Mode, fashion designer, for the first time ever! At Disney’s Animal Kingdom Theme Park, a new show inspired by “Up” will star Senior Wilderness Explorer, Russel and his furry-friend Dug, just in time for the park’s 20th anniversary. Toy Story Land is set to open this summer at Disney’s Hollywood Studios. When it opens, you will “shrink” to the size of a toy and join in the fun with Woody, Jessie, Buzz, and all of Andy’s other toys in Andy’s Backyard. Here you can take a ride on the Slinky Dog Dash Family Coaster, take a spin on Alien Swirling Saucers or the current guest favorite Toy Story Mania! We also want to remind you that it was previously announced for an upcoming “Ratatouille” inspired attraction in the France Pavilion in Epcot’s World Showcase. This attraction will be patterned after the experience in Disneyland Paris, where you can shrink down to the size of Remy and join him on a race through Gusteau’s kitchen and restaurant. Ratatouille is already the #1 family attraction at Disneyland Paris and will be a fantastic addition to Epcot. With all of the new, exciting, and upcoming things happening with Disney Parks and beyond, you won’t want to miss it! So, contact your Upon A Star Agent today to discuss your next vacation!